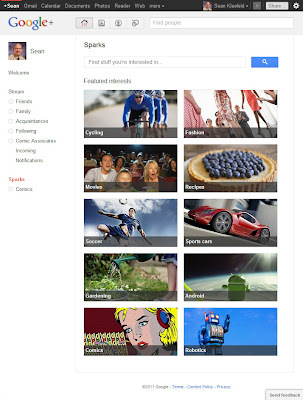 I managed to score a Google+ account last night (thanks, Keidra!) and have been trying to poke around and figure out how it works and compares to Facebook. It seems like some of the features are radical improvements over Facebook, but I've only really had a chance to look at it for an hour or two, so I hesitate to make any snap judgments. But, one of thing that strikes me as a significant improvement over Facebook is this notion of "Sparks." It's basically a subject aggregator that works off Google's inherent news search capabilities. (As near as I can guestimate right now.) Which means that you're not hooking into a specific RSS feed or anything, you're just asking to see cool stuff on a particular subject. Comics featured right there on the first page, right out of the gate! A lot of the articles are ones I might've seen elsewhere -- offhand, I'm seeing articles from The Beat, Newsarama, CBR, etc. -- but there's also some articles I could well have missed otherwise. Pieces from Kickstarter, Vimeo and The Seattle Times are showing up in the feed as I type this. And these all seem to be actual comic book articles, not superhero articles that briefly mention a character first appeared in comics. I'll see how well this actually works over the coming days and weeks, but I just thought it was a cool little surprise to see Comics given a fairly high prominence. Actually, no, that is not what is happening. Google is rolling out a new approach to ranking, called, I believe, the "bubble". It is ranking what it brings up based on what you have searched on in the past, similar to Amazon's recommendations. Presumably you have searched on a lot of comics articles and websites in the past, so Google is making those a priority for you personally. Similarly, if you clicked a lot of articles of a particular political slant in the past, it will give you more articles with the same bent in the future, encouraging all of us to live in our little "bubbles" of information -- or lack thereof! The thought had occurred to me, but that wouldn't explain several of the other subjects presented. I can maybe understand "Recipes" and "Garden" based on the handful of times the S.O. has used my computer, and "Android" might be a misinterpretation based on my interest in sci-fi, but I can't think of any search parameters either of us have ever used that would result in "Cycling", "Sports Cars" or "Soccer".